Grande Garage Bazar a favore dei ghepardi! Se siete in zona, domenica 7 agosto siamo presso la sede del CCF a parlare di ghepardi e…. Vi aspettiamo! In visita la Cooperazione Turca al CCF ! Questa settimana un’altra visita al CCF da parte della TIKA, l’agenzia di cooperazione turca in Namibia. L’anno scorso ha donato al CCF un veicolo per il trasporto dei cuccioli ai farmer. Il direttore e coordinatore Dr. Cuneyt Esmer ha portato con se’ un giornalista che scriverà’ un articolo sul CCF. Arable land per person is shrinking throughout the world. In Namibia, this is a huge problem. Open lands that have served as farmlands for decades and decades are being taken over by a native plant with thick, woody spines. This process is known as bush encroachment. Left unchecked, this plant (Senegalia sp) grows so aggressively it drains underground water tables and prevents other plants from thriving, degrading the land until it is not capable of supporting life. When this happens — or when large sand and gravel plains proliferate due to lack of grass, like the areas near Namibia’s coastline — these tracts of degraded land can merge together slowly over time and form a type of desert. This is termed desertification. Namibia’s erratic weather patterns and climate change compound the issue or arable land. If we get rain, it’s heavy thunderstorms. Wet days are usually followed by long periods of drought. On average, we’re experiencing fewer days with cooler temperatures and more days with hotter ones. And, by 2050, the population of sub-Saharan Africa is anticipated to double in size. More people means more livestock, more overgrazing and less arable land — leading to increased competition between humans and wildlife, with elevated levels of conflict. With a rural economy based on farming, and a human population that could as much as double in the next 34 years, Namibia and other countries in southern Africa need solutions. To address, the United Nations established its Convention to Combat Desertification in 1994 to link environment and development to sustainable land management practices. It specifically focuses attention on the drylands – arid, semi-arid, and dry sub-humid areas, where some of the most vulnerable human and wildlife populations are located. Its goals are to restore and maintain land and soil productivity and mitigate the impact of drought. At Cheetah Conservation Fund (CCF), we develop strategies and take conservation action to support the convention’s goals. In Namibia, migrations of animals are predicted to move east due to the drought cycles and problems with arable land. 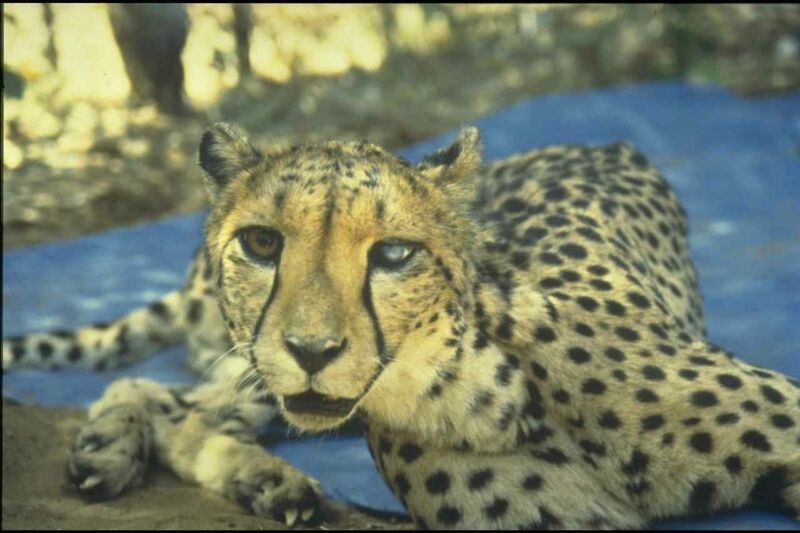 While distribution, abundance and spatial organization of most native game species are adversely impacted by thickened thorn bush and desertification, in Namibia, none are more so than the cheetah. Already fragile, Namibia’s cheetah population lives mostly on open farmlands and hunts by day. Farmers see cheetahs near livestock more than other predators, so cheetahs bear a disproportionate blame for livestock losses attributed to predation. This means cheetahs are more likely to be killed in misguided retaliation attempts or trapped and removed than other large carnivores, even though the other animals may have been responsible. Thickened thorn bush also presents a physical danger, as spiny branches sometimes cut cheetahs during high-speed hunts. 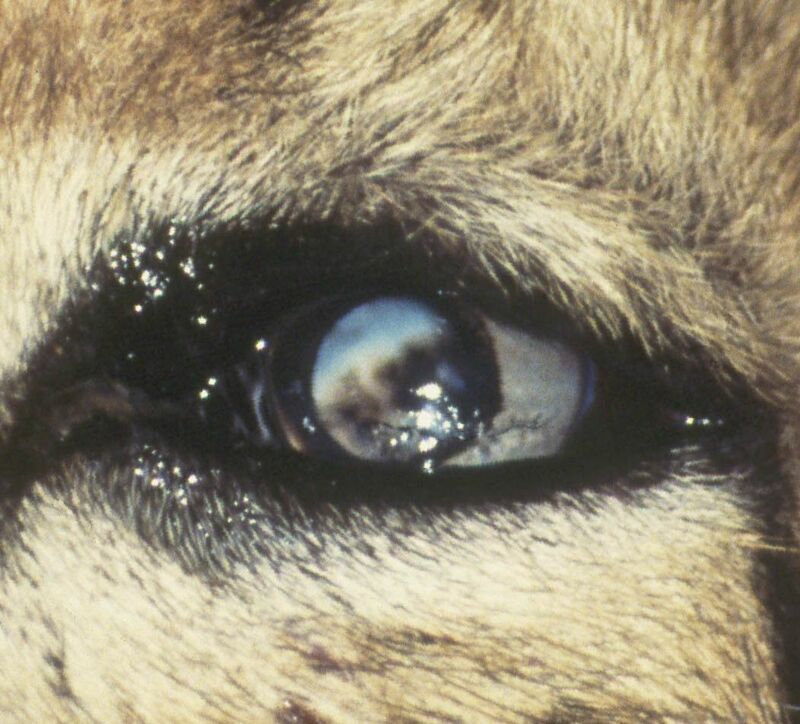 We have seen many debilitating injuries, including cheetahs that have been blinded by thorn bush tearing into their cornea. 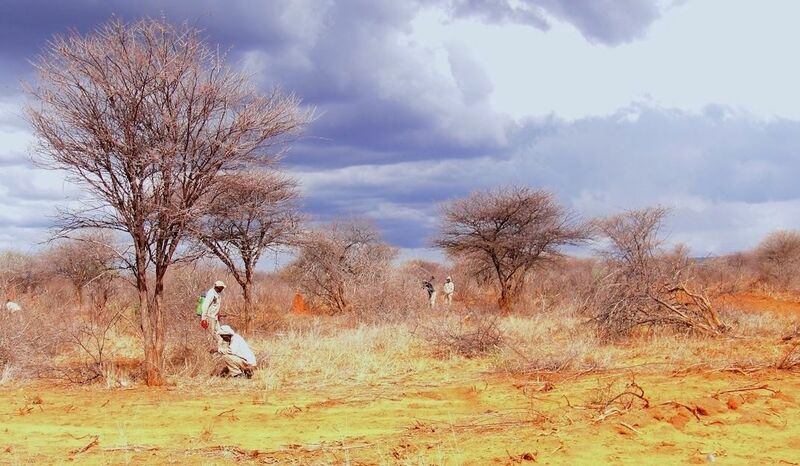 To mitigate the impact of bush encroachment, prevent desertification, and restore balance to the cheetah’s ecosystem, CCF conducts activities in three key areas: farmer training, livelihood development, and habitat restoration. Since agriculture is strongly influenced by weather and climate, significant changes would affect a large portion of the population. An estimated 70% of Namibians rely on subsistence agriculture on communal lands, with an additional 10% involved in commercial farming. That’s four out of every five Namibians. But most have never had any type of education or training. To fill this need, CCF conducts a weeklong course for rural men and women farmers at our Field Research & Educational Centre in Otjiwarongo, Future Farmers of Africa. In additional to animal husbandry, valuation, and basic livestock veterinary care, the course teaches sustainable agricultural practices to reduce overgrazing and how to manage predators on farmlands with non-lethal means. To help rural citizens earn better livings and to have options that do not involve agriculture (which reduces the pressure of the country’s livestock populations on land), CCF offers several types of job training. CCF maintains The Dancing Goat, a creamery that’s part of our model farm operations used to teach the crafts of cheese, soap and fudge making. We’ve also launched a program to economically develop Hereroland, the rural communal lands adjacent to CCF. Our project is known as The Greater Waterberg Landscape Initiative, and we offer training in arts and crafts making, ecotourism ventures, and farmer training similar to Future Farmers, but conducted on the local level. The latest expansion to The Greater Waterberg Landscape Initiative is a training program for people who want to become para-veterinarians. As paramedics assist human populations, para-vets tend to basic health needs for livestock, and sometimes even wildlife. We estimate more than 26 million hectares of commercial and communal farmlands in Namibia have been severely impacted by bush encroachment since the 1950’s. Land productivity in some of these encroached areas has declined as much as 100%. To reverse bush encroachment and restore the habitat, CCF is returning to the ecosystem native species that consume Sengalia sp, such as black rhinos and giraffes. Not only are they helping control its spread, but having these species are important to maintaining a biodiversity in a healthy, balanced ecosystem. 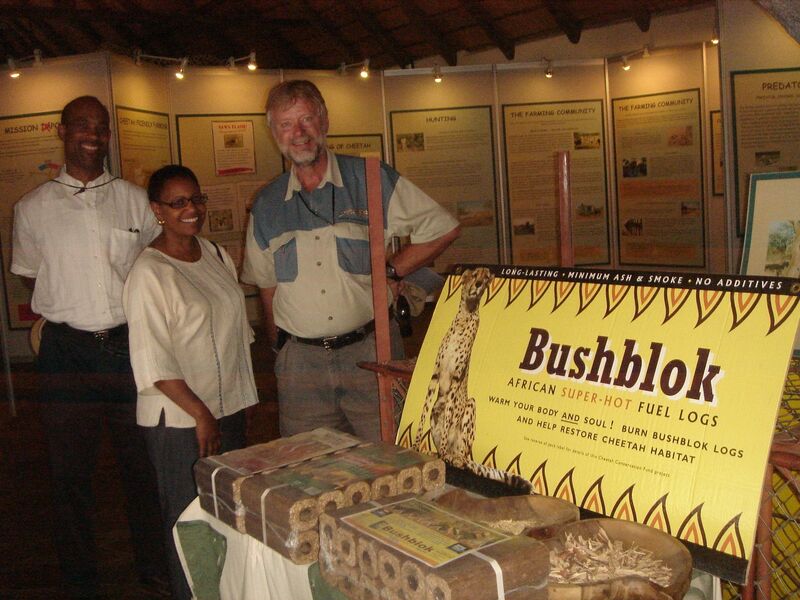 CCF is also combating the issue of encroachment through production of a biomass fuel log made from sustainably harvested thorn bush under the trade name Bushblok. Not only does this compressed wood pellet log help reduce bush density, but it also creates a clean-burning energy alternative that heats homes and supplies cooking fuel for residents of Sub-Saharan Africa, the majority of whom do not have electricity. CCF Bush restores land that’s been taken over, so cows may graze and cheetahs may safely hunt, and large landscapes remain intact for the benefit of the entire ecosystem. CCF is developing ecological standards for ramping up bush harvesting with the goal of restoring landscape-scale tracts of cheetah habitat throughout Namibia. The CCF Bushblok factory in Otjiwarongo provides 40 middle-class paying jobs for rural Namibians, with the potential to provide many, many more. By bringing together all stakeholders and including the needs of the human populations that share the cheetah’s ecosystems, the oldest yet most endangered big cat in Africa has the greatest chances for long-term survival. But if we ignore climate change and its impact to the environment, we will only make the cheetah even more vulnerable to the inevitability of extinction. To ensure its continued existence, we need to practice large landscape conservation planning, incorporating basic human and wildlife needs, for the benefit of all living creatures.